Real-time data to deliver the highest service level to your customers. Managing a call center requires being constantly dialled into the latest metrics and KPIs so you can reduce handling times, increase productivity, and meet service level agreements. Your call center is committed to delivering the highest level of service to your customers, which is why you need to be able to meticulously monitor your performance. A call center dashboard increases the visibility of real time, business-critical metrics providing you with the information needed to respond to challenges before they become crises. Call Center KPI Dashboard – This call center KPI dashboard is about identifying trends by examining data over a longer time period. Call Status Dashboard – A real-time call center dashboard monitors key metrics that can change on minute-by-minute basis like call abandonment and volume, current service level, and call status metrics. 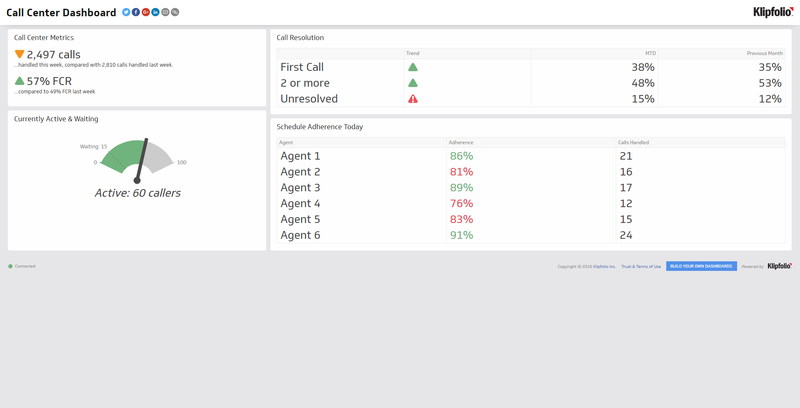 Call Center Metrics Dashboard – This call center dashboard example illustrates some of the key metrics used to monitor the status of any call center. A play-by-play of your call center performance that everyone can act on. Your partner search ends here!, at ABN. Want Microsoft Power Bi? Call us!